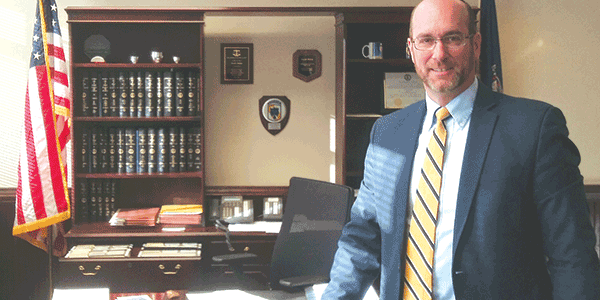 Chesterfield’s Commonwealth Attorney Scott Miles walks in his office. 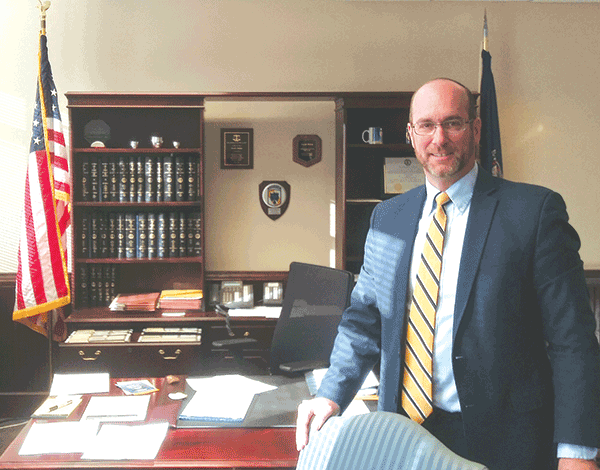 After two and a half months on the job, Chesterfield’s Commonwealth Attorney Scott Miles believes progress is being made. Democrat Miles, who won a close race over Republican John Childrey in November to finish the final 13 1/2 months of Billy Davenport’s term, was sworn in Nov. 13. Several changes that he touted during the campaign have been made, although it seems likely that he will not be able to accomplish one having to do with increasing treatment options by the time the November election rolls around. Stacey Davenport, a Republican not related to Billy, has already announced her intention to seek the post. She lost the Grand Old Party’s nomination to Childrey last year in a firehouse primary. Some policies that Miley has implemented include asking for no cash bail for defendants and others that are more lenient related to suspended driver’s licenses, simple marijuana possession and first-offense shoplifting. Regarding bail, Miles noted that Chesterfield’s five district court judges are still requiring some defendants to post bail before their release, and magistrates can also require bail before defendants see a district court judge. Nonetheless, the “no bail” policy, along with another regarding simple marijuana possession, has coincided with a 12-percent reduction in the number of defendants who required pre-trial services in December vs. October, the last month before Miles began. Sheriff Karl Leonard, who oversees operation of the Chesterfield Jail, said the jail had 898 inmates as of Dec. 1. It had 825 on Dec. 31 and 842 on Jan. 31. It costs $43,800 a year to house an inmate, “so any reduction will certainly save Chesterfield taxpayers a significant amount,” he said. Miles has implemented a “community-based prosecutors” concept will have each attorney visit a part of the county once a month as part of community outreach. “A couple of them are jumping on it early,” Miles said, noting the policy will be rolled out in mid-March. One area in which Miles has thus far not been successful in implementing is adding more treatment options for drug offenders. Miles is aware of only one recovery house in Chesterfield, while others are available in Richmond and Henrico County. Miles noted that there is a bill being considered in the Legislature that would authorize the state Department of Behavioral Health and Development Services to certify recovery houses, since no certification currently exists. He ultimately would like to see a third-party “clearinghouse” established that would communicate between places that offer treatment options and the county so that offenders’ progress can be verified. This will likely involve a faith-based component, he said. “When we get collaboration, we will raise funds privately for start-up costs,” he said, adding that a request for help from the Chesterfield Board of Supervisors would come later. Miles noted that this treatment component would come into fruition during a four-year term, if he is re-elected in November. The former Richmond prosecutor and public defender said the court-related and law enforcement professionals his office deals with have cooperated with the changes he’s made. “People are either enthusiastic or take a wait-and-see approach,” he said, noting that he was “prepared to work really hard to sell” some of his policies. “I’m even more encouraged now,” he said on Jan. 31. Miles said he has good working relationships with Chesterfield’s Sheriff Karl Leonard and Police Chief Jeffery S. Katz. “We see each other almost every day,” Miles said.